Loudspeakers are synonymous with audio reproduction and are widely used to play sounds people want to hear. Loudspeakers have also been used for the opposite purpose, to attenuate noise that people may not want to hear. Active noise cancellation technology is an example of this, which combines loudspeakers, microphones and digital signal processing to adaptively control unwanted noise sources . More recently, the scientific community has focused attention on controlling and manipulating sound fields to acoustically cloak objects, with the aim of rendering objects acoustically invisible. A new class of engineered materials called metamaterials have already demonstrated this ability . However, acoustic cloaking has also been demonstrated using methods based on both sound field reproduction and active noise cancellation . 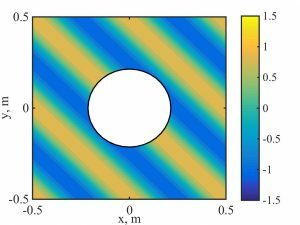 Despite its demonstration there has been limited research exploring the physical links between acoustic cloaking, active noise cancellation and sound field reproduction. Therefore, we began exploring these links with the aim of developing active acoustic cloaking systems that build on the advanced knowledge of implementing both audio reproduction and active noise cancellation systems. Acoustic cloaking attempts to control the sound scattered from a solid object. 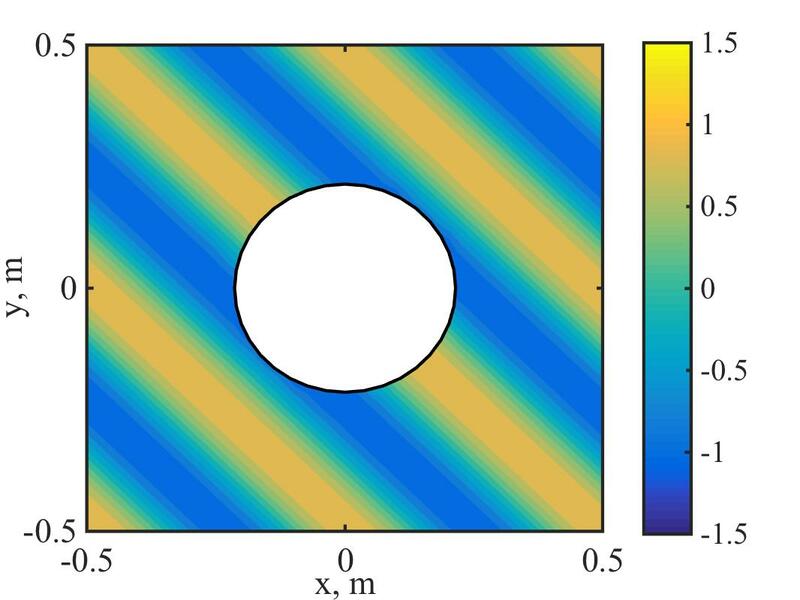 Using a numerical computer simulation, we therefore investigated the physical limits on active acoustic cloaking in the presence of a rigid scattering sphere. The scattering sphere, shown in Figure 1, was surrounded by an array of sources (loudspeakers) used to control the sound field, shown by the black dots surrounding the sphere in the figure. In the first instance we investigated the effect of the scattering sphere on a simple sound field. Looking at a horizontal slice through the simulated sound field without a scattering object, shown in the second figure, modifications by the presence of the scattering sphere are obvious in comparison to the same slice when the object is present, seen in third figure. Scattering from the sphere distorts the sound field, rendering it acoustically visible. Figure 1 – The geometry of the rigid scattering sphere and the array of sources, or loudspeakers used to control the sound field (black dots). Figure 2 – The sound field due to an acoustic plane wave in the free field (without scattering). Figure 3 – The sound field produced when an acoustic plane wave is incident on the rigid scattering sphere. To understand the physical limitations on controlling this sound field, and thus implementing an active acoustic cloak, we investigated the ability of the array of loudspeakers surrounding the scattering sphere to achieve acoustic cloaking . In comparison to active noise cancellation, rather than attempting to cancel the total sound field, we only attempted to control the scattered component of the sound field and thus render the sphere acoustically invisible. 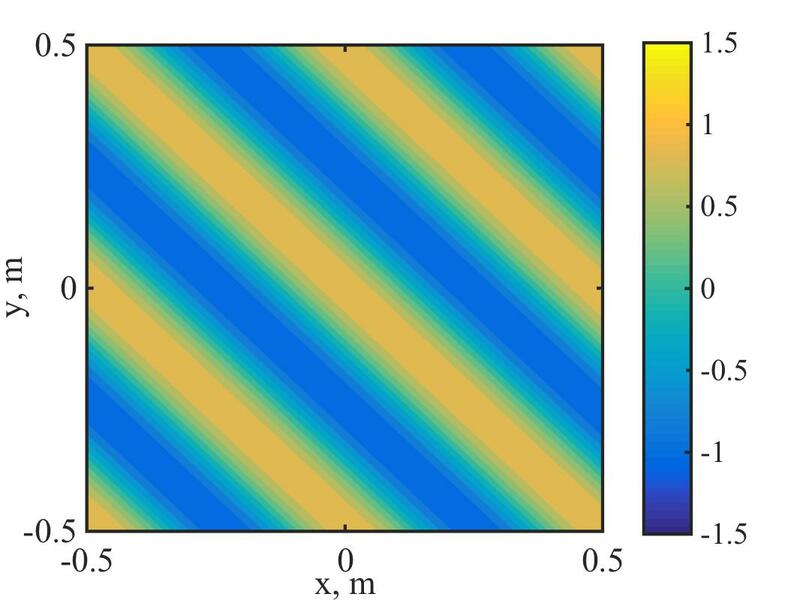 With active acoustic cloaking, the sound field appears undisturbed, where the scattered component has been significantly attenuated and results in a field, shown in the fourth figure, that is indistinguishable from the object-less simulation of the Figure 2. 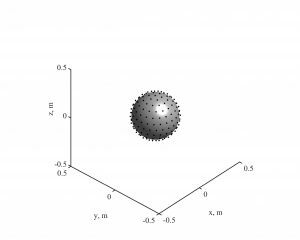 Figure 4 – The sound field produced when active acoustic cloaking is used to attempt to cancel the sound field scattered by a rigid scattering sphere and thus render the scattering sphere acoustically ‘invisible’. Our results indicate active acoustic attenuation can be achieved using an array of loudspeakers surrounding a sphere that would otherwise scatter sound detectably. In this and related work, further investigations showed that the performance of active acoustic cloaking is most effective when the loudspeakers are in close proximity to the object being cloaked. 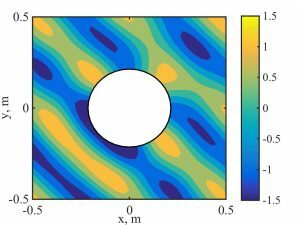 This may lead to design concepts involving acoustic sources embedded in objects for acoustic cloaking or control of the scattered sound field. Future work will attempt to demonstrate the performance of active acoustic cloaking experimentally and overcome significant challenges of not only controlling the scattered sound field, but detecting it using an array of microphones. P. Nelson and S. J. Elliott, Active Control of Sound, 436 (Academic Press, London) (1992). L. Zigoneanu, B.I. 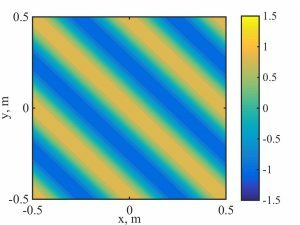 Popa, and S.A. Cummer, “Three-dimensional broadband omnidirectional acoustic ground cloak”. Nat. Mater, 13(4), 352-355, (2014). E. Friot and C. Bordier, “Real-time active suppression of scattered acoustic radiation”, J. Sound Vib., 278, 563–580 (2004). J. Cheer, “Active control of scattered acoustic fields: Cancellation, reproduction and cloaking”, J. Acoust. Soc. Am., 140 (3), 1502-1512 (2016).